15 minute Tiramisu – for real! I might have suddenly gone all Jamie Oliver and tried to find recipes that can be made under 15 mins. The slow food movement guys can have their leisurely life, but if I have to lovingly watch over a stew for 24 hrs, I think I might bust a blood vessel. In my defense I do Yoga and Meditation to ‘slow’ down, but all areas of my life are filled with a frenzy of activity. Tiramisu under 15 mins sounds like a bad clickbait title but I’ve tested this multiple times and it’s definitely for real. I’ve obviously not counted the time it sits languishing in the fridge before you serve it, but you need to cut me some slack for that! 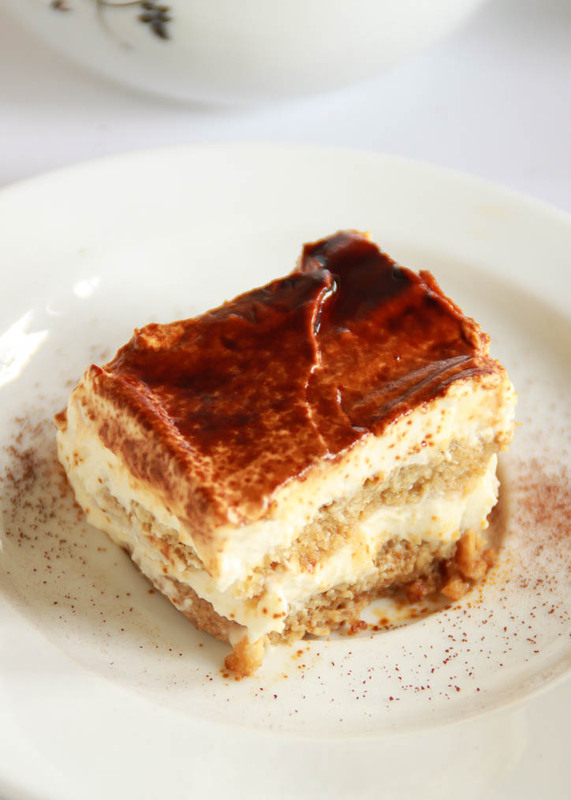 I won’t go into the boring details of why Tiramisu is called Tiramisu, but no doubt that it offers a brilliant ‘pick me up’ in the evening. It’s plain treachery that in most Italian restaurants we choose to end dinner with this coffee doused dessert and hope to pass into blissful sleep. (I mean Toscano and Chianti obviously, cause no one else in Bangalore comes even close to turning out a decent Tiramisu). 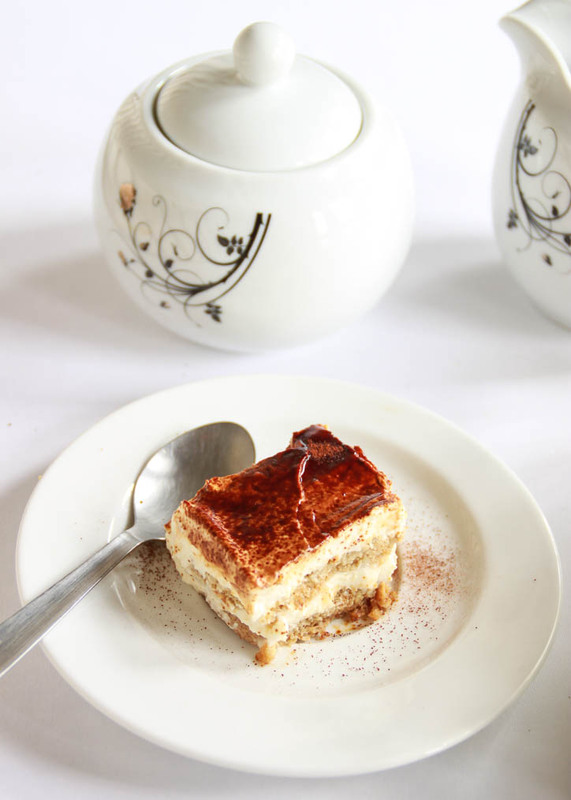 Patisserie’s may be all the exceptions, but I haven’t really parceled any Tiramisu home. 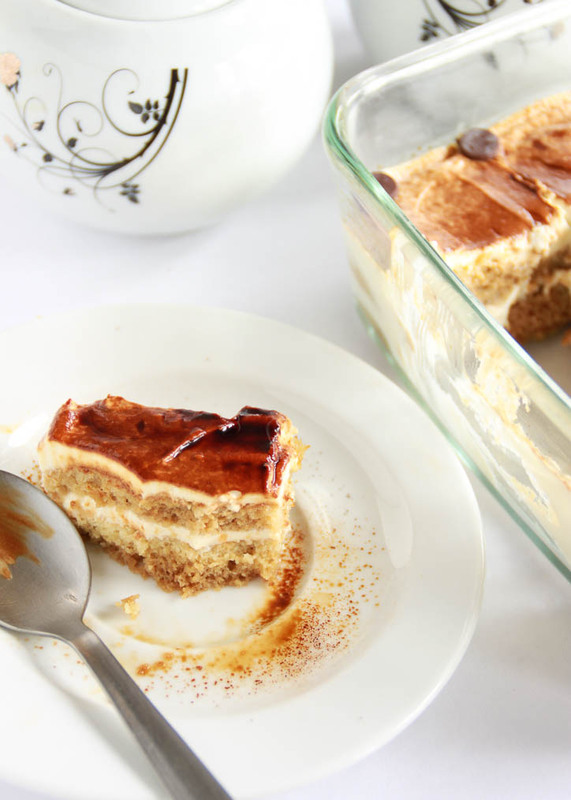 This recipe is so simple (albeit not entirely inexpensive – hello Mascarpone and Savoiardi biscuits), that you will wonder why you never attempted making Tiramisu at home before. The authentic versions use a just-cooked egg custard whipped into the mascarpone, but I find a lovely thick cream turns out a lighter and more delicate flavoured dessert. You can either dust the set Tiramisu with cocoa or for a stronger hit of coffee – try dusting it with a coffee powder and cocoa mix. As usual, I suss out recipes that are minimum fuss and maximum enjoyment, so get ready for a stellar performance! P.S. You can buy Mascarpone (Impero/ Zanetti) and Savoiardi Biscuits (Bonomi/ Vicenzovo) at Godrej Natures Basket. On an earlier occasion, I made the Savoiardi biscuits from scratch, but honestly I don’t think it’s worth the effort. If you do have some time on your hands, here’s an easy enough recipe I like to follow from the Cupcake Project. Honestly tiramisu is one of my favorite desserts. So indulgent tasting and yet so simple. Great recipe! 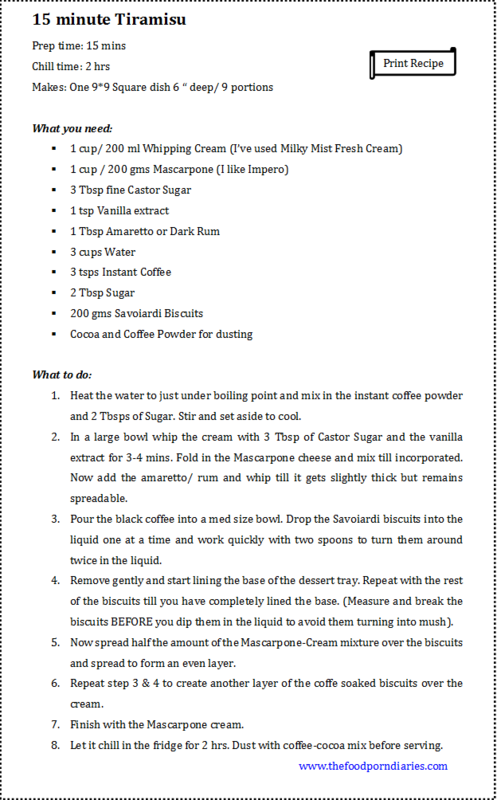 This is a great recipe and it comes out brilliantly, a must try for anyone who likes Tiramisu. The tips on where to buy the ingredients made it much less intimidating. Thanks a bunch for sharing it. Thank you Harsha. It’s always great to hear feedback from someone who actually tried it 😀 Muchos Gracias.